This is a test of the Scrippet plugin for WordPress, which would help me render bits of scripts and screenplays and such. I’ll be tweaking this until it looks OK.
SMITH stands next to BILLY, who is seated at his desk. Billy hands him a fat folder. I don’t even think you’ll need a costume, Mister Vintage. Nope. It’s like going home for spring break. Except you’re supposed to have fun on spring break. You are going to have fun, right? You should know, Billy. Isn’t there a high statistical correlation between me staying on a college campus and the simultaneous occurrence of fun? Are you accusing me of forcing co-eds on you? You might recognize the awful dialogue from The Last Domino, my cursed time-travel screenplay from Script Frenzy a couple years back. 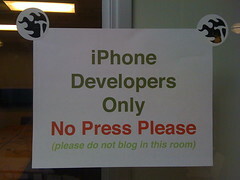 I had a great time at iPhoneDevCamp 2 in San Francisco last weekend. Lots of geekdads and their kids were in attendance. Joe Michels got an iPhone so he could show off photos of his kids, but now he’s writing apps. Carlos McEvilly (pictured) wrote code while his daughter Annika playtested games for other developers. Ray Valdes and his kids worked together on a mermaid game, while Camp organizer Dom Sagolla’s infant son Leo offered to judge the Tastiest App award. Wow. If there was any doubt that the iPhone is a hot platform, iPhoneDevCamp 2 just squashed it like a tank tread over a pile of Zunes. Hundreds of attendees got together for a weekend of iPhone application hacking, discussion and beer. Buckets of beer and piles of pizza, all supplied by sponsors eager to find out who might have the next killer app. And apps there were aplenty; 44 teams submitted them for the hackathon, including 3 top apps from satellite camps. I also started a project page for Fwerps, because you know I need more projects to work on.